June 19 Thursday Warmer (Mer reaching 88°+) sun shining most of day, all well with us. I helped Anna about cooking little, over to Rose's of errand, spending rest A.M. at little jobs, after dinner helping Rose about her work, so we might make few calls on way to nite society (M.E.) I called at Vashti Planks no one in. R- & I called on (Fonnet? 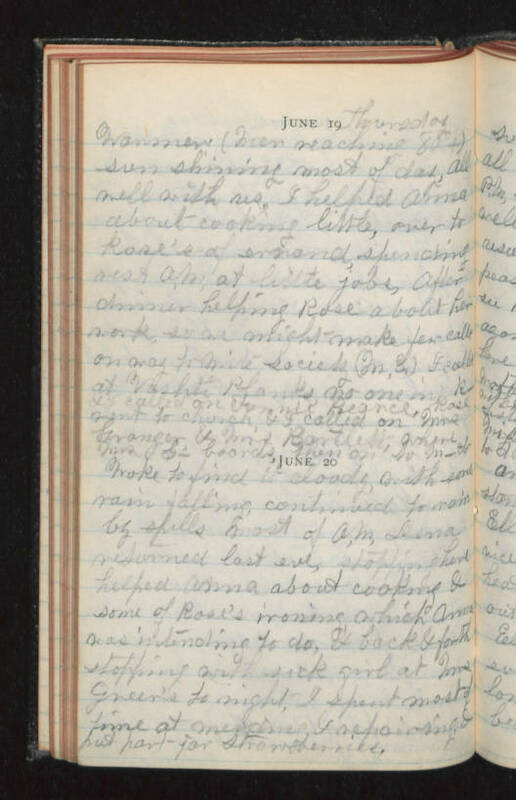 Reance), Rose went to church & I called on Mrs. Granger & Mrs Bartlett, where Mrs G- boards, then on to M- June 20 Woke to find it cloudy, with some rain falling, continued to rain by spells most of A.M. Lena returned last eve, stopping here helped Anna about cooking & some of Rose's ironing which Anna was intending to do, & back & forth stopping with sick girl at Mrs. Green's to night I spent most of time at mending & repairing & put part jar strawberries.